Interesting. I didn't realize GK was out of the company so early. He left even before the first guitar has been made . Trump fukd him over back then too!! Thank you so much for posting my Part 1 of 2 interview with Gary Kramer. My name is Eric and am the host of the Kramer Korner show. This was a wonderful opportunity for my son & I. I have included part 2 below, where the interview continues at Gary Kramer Guitar Cellars. Something to note. Gary came down rather sick after NAMM (the dreaded NAMMthraxx) but was a champion and still gave 100% in his interviews. This was an absolute pleasure to stay as guests of his for 3 days at his home. For now, here is Part 2 of 2. Thank you for allowing me to be part of this forum! Good to see you made it here Eric, welcome. Great videos, Eric. Thank you so much for those, I really enjoyed them, although I wish part 2 would have been at least an hour long... And welcome here, hope to hear from you often in this forum! floydrose_5150 wrote: Thank you so much for posting my Part 1 of 2 interview with Gary Kramer. My name is Eric and am the host of the Kramer Korner show. Welcome aboard Eric. Great to have you as a part of this forum! I really enjoy your Kramer Korner and EVH YouTube shows. Keep up the great work. Thanks for joining our little forum family Eric. Awesome to see your involvement with Kramer guitars has generated such great opportunities to bring fourth a bit of the unspoken history of the brand. Looking forward to your future Kramer Korner posts and what the month of May will bring when the rebooted Kramer guitars start shipping it’s new product. Oh and I guess I’ll hand it over to you to post future Kramer Korner video links. Thank you all for the warm welcome. I do truly appreciate it greatly. 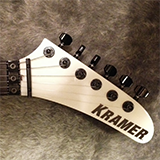 Looking forward to exploring the Kramer Guitars legacy via interviews and more on my show. Over the coming year I'll extend invitations to Kramer owners of all types to the show, where we can learn, discuss and share. My knowledge on Kramer is somewhat limited (although I was able to impress Gary Kramer here and there with a few facts lol). I have owned many vintage Focus, Strikers, Barettas and more over the years, and now only own a couple of the new Gibson era Kramers as being added to the Kramer Artist roster. I do look forward to getting some old (vintage) models again soon too, plus demoing the new models released at NAMM. Hang in there with me as I start at the bottom floor with Kramer Korner and aim to bring you something awesome throughout this year.